Considering the amount of films he has made since first landing on the scene in 1991, Japanese director Takashi Miike is the filmmaking equivalent of the Energizer bunny; he just keeps going and going and going. He has made a staggering 100 movies since then, fifteen of which were made over just the course of a YEAR (between 2001 and 2002, to be exact), and most of them have cemented him as one of Japan’s most prolific, and often controversial, filmmakers with his movies ranging from ultra-violent to ultra-kid-friendly. Blade of the Immortal, officially his 100th film, is most definitely of the former, a bloody and endlessly entertaining odyssey in feudal Japan that offers some highly engaging samurai action as well as gallons of on-screen blood and violence, all of which are a real treat to watch. Based on the manga of the same name, our hero is Manji (Takuya Kimura), who in a black-and-white prologue we learn is a fugitive samurai that helplessly watches as his sister is brutally murdered by a large group of bounty hunters. After the following epic battle, Manji is near death himself, but is saved by a mysterious woman who inserts into his body some bloodworms that regenerate his body and effectively make him immortal. 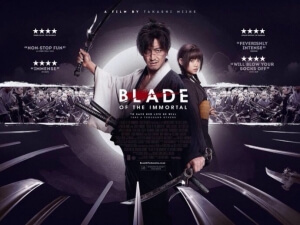 Fifty years later, he is approached by a young girl named Rin (Hana Sugisaki), who has vowed to avenge her slain father after he is killed by the Ittō-ryū and its ruthless leader Anotsu Kagehisa (Sōta Fukushi), and who asks Manji to be her bodyguard on her quest for vengeance. From there, blood is spilled, limbs are torn, and dozens upon dozens of people are killed or mortally wounded in pretty brutal ways, including even our hero at several points. Knowing nothing about the manga this was based on, and judging it purely as a film first and foremost, I found Blade of the Immortal to be a pretty fun movie that calls back to the old kind of violent samurai flicks from the 1970s or 80s (probably helping was the fact that the screening I saw this is was projecting it in 35mm, which already gives it an old feel to it). The fight scenes are expertly choreographed and tightly directed, with every swish and slash of all visible swords being felt with such vibrant agony that even in the tamer scenes of violence they can still feel like they’re cutting deep into flesh. You feel every slice against the skin of either the hero or one of many assailants, and the way the sound editing works in this movie as well it allows you to fully experience the sword’s penetration in the most effectively gruesome manner. Miike’s lust for the ultra-violent has been glimpsed before in previous works like Ichi the Killer, but even for those unfamiliar with his work will still be left astounded by the lengths he will go to give a scene the fully bloody treatment it deserves, whether it involves decapitated body parts falling off a body like in a Bugs Bunny cartoon, or a character meeting their grisly end in a giant splat of blood after a giant fall. Fans of on-screen violence will surely get a giant kick out of how it is all executed (no pun intended) in this film when they get the chance to see it. An unexpected standout about the film is how the characters themselves often tend to transcend certain stock archetypes and have their own mini-arcs that make them more interesting. Sure, there are still those that remain fair archetypes throughout the whole film, but there are some – the villains included – that are given interesting backstories and family histories that help you understand their motives a bit more, instead of just having them be the typical stock villain type. Other characters pop up every now and then who, just by looking at them and how they’re dressed, how they fight, what they use to fight etc, really make you want to know more about them and how they got to this point when they first make their introductions. I’d be interested to know if many of them are taken directly from the manga, because they certainly make their case for longevity here. The only real gripe I would have about this film is that the plot treads very familiar ground, taking the True Grit model of a young waif calling upon the aid of an experienced fighter to help her seek revenge for a loved one, but even then there were enough surprising moments and interesting characters that kept it from being completely predictable. It doesn’t ruin any potential enjoyment you might have from this film, which still remains a fun, old-fashioned samurai flick that should satisfy audiences, as well as give Takashi Miike the international attention needed to make a hell of a lot more films to surpass even the grand number of 100. Blade of the Immortal is a fun and ultra-violent samurai flick that contains lots of tight action and amusing moments of gore, as well as a good number of interesting characters to keep itself afloat in the blood.